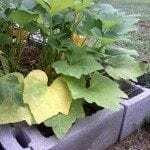 Our Patty Pan squash has many "flowers" or blooms at present, but the squash is rotting on the bloom then to the squash. Help! Thank you Jon K.